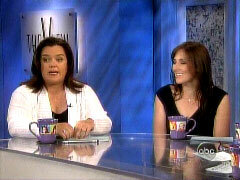 As co-host of ABC's The View during the 2006-07 television season, Rosie O'Donnell used her daytime perch to push an array of extreme left-wing and anti-American views. Soon after her debut in September 2006, O'Donnell used the anniversary of the 9/11 attacks to insist that "radical Christianity is just as threatening as radical Islam." In a similar vein, she advised her audience: "Don't fear the terrorists. They're mothers and fathers," while suggesting that "the Patriot Act has robbed us of us our civil liberties in this country, that fear has taken over from faith in democracy, in the Constitution" In March, O'Donnell even suggested that the government was hiding the truth of 9/11 attacks, arguing: "Miraculously, for the first time in history, steel was melted by fire. It is physically impossible." 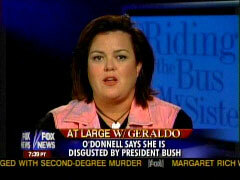 O'Donnell's mean-spirited approach was known before she was hired by ABC. Guest-hosting The View back in 2005, she railed against FNC's Sean Hannity, calling President Bush "a war criminal" and demanding to know "how many American poor children are dead, fighting a war that was never needed?" In an appearance on FNC's At Large with Geraldo Rivera earlier in 2005, O'Donnell similarly foamed: "He is basically a war criminal. Honestly. He should be tried at The Hague." Here are some of O'Donnell's more noteworthy left-wing outbursts, many accompanied by audio and video clips, and with links to more detailed descriptions from MRC's CyberAlert newsletter or our NewsBusters blog. "655,000 Iraqi Civilians Dead. Who Are the Terrorists?" 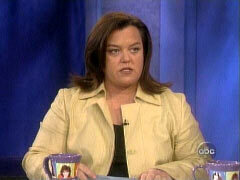 On May 17, 2007, Rosie O'Donnell argued that the United States is the real source of terror. Citing an inflated figure for the number of Iraqis killed in the war (most of whom have been killed in terrorist bombings or sectarian violence), Rosie leveled her anti-American charge: "I just want to say something. 655,000 Iraqi civilians are dead. Who are the terrorists?" An appalled co-host Elisabeth Hasselbeck demanded: "Wait, who are you calling terrorists now? Americans?" O'Donnell stood her ground: "I'm saying if you were in Iraq, and the other country, the United States, the richest in the world, invaded your country and killed 655,000 of your citizens, what would you call us?" More 9/11 Blather: Rudy Giuliani Hid WTC Steel in China?? On May 14, 2007, Rosie O'Donnell again suggested al Qaeda had nothing to do with the collapse of World Trade Center Seven: "It was in the building that mysteriously collapsed at 5:30pm." After co-host Joy Behar accused former New York City Mayor Rudy Giuliani of not helping recovery workers, O'Donnell suggested he was the ringleader of a conspiracy to hide "all of the steel" from the massive Twin Towers: "He was, you know, instrumental in making sure that all of the steel was removed and shipped to Canada right away, Giuliani was, shipped to China, sorry, right away." Even Behar was befuddled: "For what purpose?" O'Donnell charged: "Well, to get it out of there and to have, you know, all of the stuff but it was all gone. So there was no like metal to test." O'Donnell on Imus: Thought Police Leads to Guantanamo Bay In a discussion about Don Imus's racist and sexist remark about the Rutgers womens basketball team, Rosie O'Donnell warned that "it's not a freedom if you outlaw certain words or thoughts, because then the thought police come and then before you know it, everyone's in Guantanamo Bay without representation." O'Donnells leap from Imus to Guantanamo prompted co-host Joy Behar to exclaim: "What a jump!" 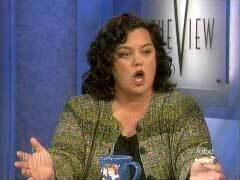 On the November 9, 2006 The View, Rosie O'Donnell equated the post-September 11th America to the "McCarthy era" and claimed people were "blacklisted" and labeled "unpatriotic" if they expressed any dissent from the Bush administration. O'Donnell also defended the United Nations as a "world voice" and took a shot at Iraq war ally Britain for being "on our side and in our pocket." Filling in Tuesday for Star Jones on The View back in 2005, O'Donnell angrily yelled and screamed at guest Sean Hannity. O'Donnell outrageously claimed that "Christopher Reeve died without hope because of the religious separation lack of separation of church and state by this administration. The man died without hope of a cure because of the lack of stem cell research."